Identification: Large globular shaped shell. Table 1. States with nonindigenous occurrences, the earliest and latest observations in each state, and the tally and names of HUCs with observations†. Names and dates are hyperlinked to their relevant specimen records. 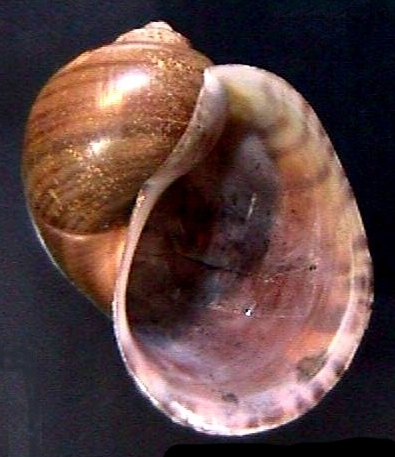 The list of references for all nonindigenous occurrences of Pomacea haustrum are found here. Means of Introduction: Probable aquarium introduction. Status: This is the only known area where this species is established in the United States (Rawlings et al. 2007). Remarks: Research by Savaya-Alkalay et al. (2018) suggests that the development of all-male prawn populations of Macrobrachium rosenbergii has the potential as an biocontrol agent over hatchling and adult apple snails (Pomacea spp.). Medium-sized and large prawns (10–30 g) efficiently preyed on snails up to 15mm in size, while small prawns (up to 4 g) effectively consumed snail hatchlings. Rawlings, T. A., K. A. Hayes, R. H. Cowie, and T. M. Collins. 2007. The identity, distribution, and impacts on non-native apple snails in the continental United States. BMC Evolutionary Biology, http://www.biomedcentral.com/1471-2148/7/97. Savaya-Alkalay, A., Ovadia, O., Barki, A., and A. Sagi. 2018. Size-selective predation by all-male prawns: implications for sustainable biocontrol of snail invasions. Biological Invasions 20:137–149.